White Collar Fraud: Why did Overstock.com President and COO Jason C. Lindsey really resign? Why did Overstock.com President and COO Jason C. Lindsey really resign? On December 31, 2007, Mr. Jason C. Lindsey resigned, effective immediately, from his positions as President, Chief Operating Officer (principal operating officer) and a member of the Board of Directors of Overstock.com, Inc. (the "Company"). Mr. Lindsey intends to spend more time with his family, but also intends to remain a part-time employee of the Company and to work on special projects as requested from time to time by the Company. Copies of a press release issued by the Company regarding Mr. Lindsey's resignation and of Mr. Lindsey's letter of resignation are furnished herewith. Mr. Lindsey's principal duties will revert to the Company's Chief Executive Officer, Patrick M. Byrne. However, at 8:41 PM (local Utah time) on New Years Eve of the same day that Jason C. Lindsey resigned, but before news of his resignation was released, Patrick Byrne posting under his alias Hannibal on the InvestorVillage message board, claimed that his "calender (sic) is clearing up a bit." Did Patrick Byrne know about Jason C. Lindsey's resignation at the time of his message board posting? Why would Byrne have more spare time if he knew that that Jason C. Lindsey was resigning? Perhaps it was as big a surprise to Byrne as it was to the rest of the market? According to Jason C. Lindsey's resignation letter, he claimed that he discussed his resignation with Patrick Byrne during the afternoon of December 31, 2007, before Byrne's InvestorVillage message board post above. Was the letter backdated or how could the delusional Byrne have more spare time after losing his President and COO? The question is, why is Lindsey resigning now? Was the SEC investigation of Overstock.com an undisclosed factor in Jason C. Lindsey's resignation? Overstock.com is the subject of a continuing investigation by the SEC, particularly into its accounting and disclosures. Patrick Byrne has admitted to being the target of the SEC probe, in contrast to his previous denials. Overstock.com had waited until almost an entire year to disclose Patrick Byrne's receipt of a personal subpoena from the SEC. During fiscal year 2006, Overstock.com lost over $100 million and had negative gross margins on its direct sales in the last quarter as its total revenues declined. 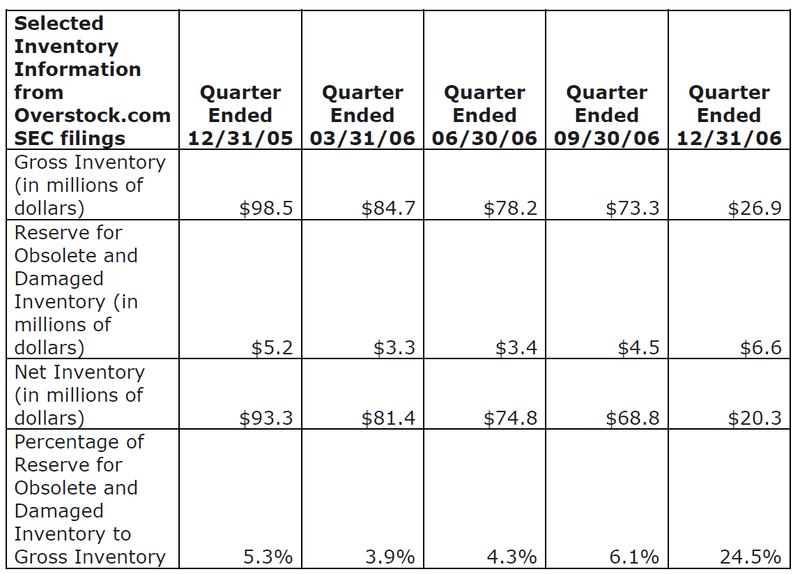 One issue that the SEC is considering in its investigation is if Overstock.com had taken artificially low inventory reserves in the previous quarters of fiscal year 2006 to decrease reported losses, waiting until after an infusion of about $40 million in new equity on December 15, 2006, before taking appropriate inventory write downs. Just a few short weeks later, the company released its 10-K for the year. In that filing, the company reported its highest ever level of inventory reserves, making it quite clear that the slow moving inventory had not been moved (contrary to Lindsey’s earlier assertion). Well, one part of the duo’s statements is true. Things got very ugly. During fiscal year 2006, Overstock.com had huge losses (over $100 million) and in fact Overstock dumped a bunch of inventory. Gross inventory levels (before reserves) started the year at about $98.5 million and dropped to about $26.9 million by the end of the year, about a $71.6 million drop in inventory. How could Overstock.com have “sold it” and gotten “rid of all the slow moving inventory” if the company actually estimated that it had more slow moving inventory in both absolute dollars and relative amounts? 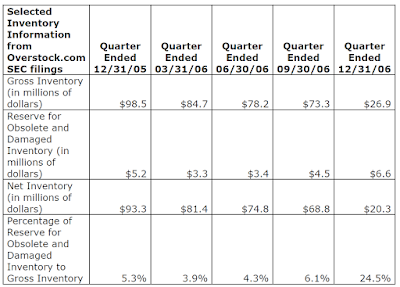 Was Overstock.com burying its “mistakes” until after its equity infusion of about $40 million on December 15, 2006? While Jason C. Lindsey may have resigned to spend more time with “family” and “outside ventures” he will need to allot a considerable amount of time during 2008 to explain this series of deceptive comments (and a whole host of other deceptive comments) to the SEC, lawyers for Copper River and Gradient, and perhaps other regulatory authorities. I'm not sure too much can be read into the Q4 increase in reserves. They could have a process for valuing inventory that's consistent and maybe even sensible and changes in response to new information. Flooding their model with a lot of data from sales at cut rate prices, as they did, could have had the effect of automatically lowering the valuation item by item. My guess is that the resignation is what cleared up PB's calendar. Not sure how that works.